Our guest, Byron Matthews is the President & CEO of Milller Heiman Group. B2B companies can assess their sales teams’ gaps and opportunities in relation to each component of sales enablement and look for the alignment (per the Clarity Model). Sales enablement cannot be put in a box like other functions. It is cross-functional, and orchestrates all enablement efforts across all “boxes,” including its alignment with the customer journey. Defining sales enablement: Sales force enablement is a strategic, collaborative discipline designed to increase predictable sales results by providing consistent, scalable enablement services that allow customer-facing professionals and their managers to add value in every customer interaction. 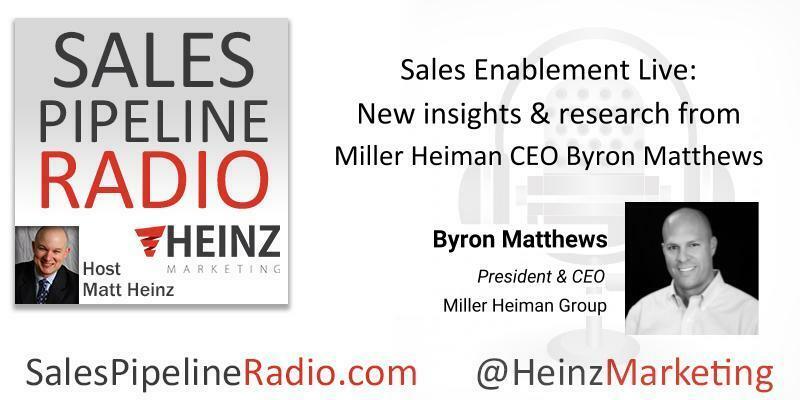 More about and from Byron: Anyone familiar with Miller Heiman Group (brands include: Miller Heiman, Huthwaite, AchieveGlobal, Impact Learning, Channel Enablers, and CSO Insights) knows that championing the customer experience is a main tenet of their mission—and also one that I happen to share.As President and CEO of Miller Heiman Group, I bring a broad depth of experience in growing, leading and providing guidance to the best organizations globally surrounding their sales processes, as well as the leading operations that support the mission of a great sales organization. Throughout my career, I have sought out challenges and answered demands that call for singular vision, energy and creativity. I have consulted and collaborated with industry leaders throughout the world and crafted new funnel-management solutions, compensation plans, sales methodologies, and sales-management processes, as well as developed and implemented sales-operations capabilities, sales structure, and territory design, for such Fortune 500 companies as Microsoft, AT&T, Sprint, and Aflac. Personally, I am passionate about the education of sales as a discipline. In collaboration with university faculty and administrators, I am working to drive a nationwide effort to incorporate the study of sales into graduate and undergraduate academic environments. I teach and volunteer my time as a guest lecturer for universities including Cornell and Harvard Business School and contribute to published academic and industry research on sales strategy and concepts. I also run sales boot camps and coach, train, and judge students at university sales competitions across the U.S. and participate regularly as a featured speaker at industry wide events.